We live in an era where internet plays a major role in the growth of a business or services. Almost all businesses are on the digital platform or using the internet to drive more conversions for their business or advertise or market their business through the internet. The times we live in are dominated by cutthroat competition and it is important to have the right strategy to succeed. 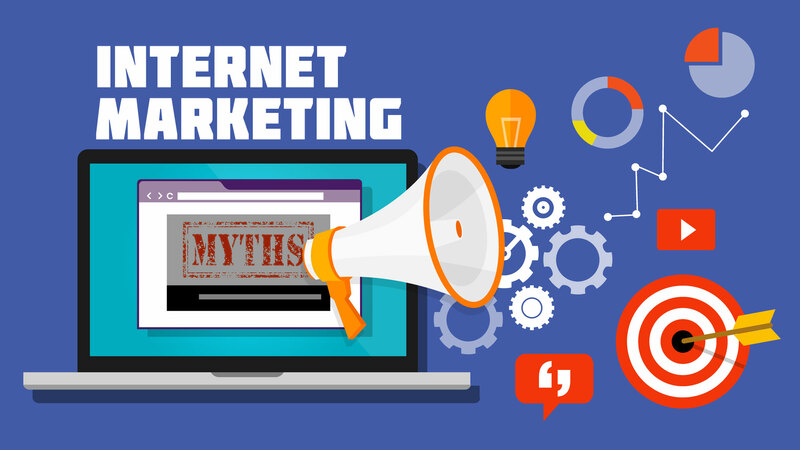 Although there are tried and tested methods of implementing Internet Marketing effectively, businesses often make the mistake of believing in myths. Let us look into some of the common myths that companies often fall prey to that keep them from growing. A common myth that most of the businesses believe in is that a higher ranking on the search engine page is good for the business as far as internet marketing is concerned. No doubt a higher page ranks is beneficial for a website but banking only on a better page rank will not do the trick. All the traffic coming to the website will not lead to a conversion if there are no effective marketing strategies in place that actually help in driving conversions. A score of website owners falls into the trap of believing that adding new content to the website is a waste of time. They are of the opinion that adding new content does not do any good to the website and their business. This is an absolutely false notion. Adding new content to the website is never a time waste. A website should update fresh and engaging content from time to time to generate more traffic on the website. Good content also helps in generating lead conversions. Compelling and engaging content form the cornerstone of the effective internet or digital marketing. AdWords is a Google entity where people advertise and market their website or business through the Google AdWords campaign. These advertisements of your business website are shown on the search engine pages when the specific keywords are typed to search for them. There exists a common myth that paying for this Google AdWords campaign will boost the ranking of the website. There is no relation between the organic page ranking of a website on the search engine and Google AdWords campaign. The website will not be ranked higher on the search engine page results if they pay enough in these Google AdWords advertising campaigns. Some novice business websites or internet marketers often fall prey to the misconception that keeping a track of internet marketing trends is time taking and cumbersome and not an easy task. With technology advancing at such a fast pace, there are a plethora of techniques and tools made available to the digital marketers. These tools and trends help you identify the right strategies for your digital marketing campaigns to succeed and with the advent of new age technologies like Google Analytics, it, in fact, becomes less cumbersome to keep a track of the new trends and techniques. Many businesses often set a very small budget for their digital marketing needs. The reason behind this is that they believe that Search Engine Optimization done for a website is just a one-time investment and this process does not need to continue. This notion cannot be more wrong. Search engine optimization is not a one-time investment or process, instead, it is a continuous process that helps a business website improve its page ranking on the search engine results. If a website owner does not invest in Search Engine Optimization, it is needless to say that within a short period of time, his or her digital marketing campaigns will be rendered useless. Another very common myth believed by digital marketers is that the high usage of keywords will help the website attain a higher page ranking. This myth can lead to no good because as it is seen, it often happens that digital marketers in their pursuit to attain a better page ranking for their website fill the content of their website with keywords. This process is known as keyword stuffing and it does not have any real benefits instead does more damage to their marketing. Stuffing the content with so many keywords can act as a deterrent because the user experience is affected if too many keywords are used. There is no denying the fact that digital marketing helps a business grow manifolds. Internet marketing or digital marketing is one of the cornerstones of a having a good marketing strategy but it does not encompass all the strategies that need to be undertaken to successful marketing. The dividends from a good digital marketing campaign are great but investing in just one strategy does not lead to much success. It is equally important to invest in offline marketing strategies as well. Companies often believe that highlighting negative feedbacks will be disadvantageous for their brand image. There is no company or services in the world who has never gotten any negative feedback. A good feedback system and addressing the negative feedbacks of the customers and acting on their problems does a lot of good in building the credibility of the business in the long run. Right Ryan, clear aim and dedication towards it always works. Thanks for the feedback.